A Theatre Ad Infinitum production. Nir Paldi in Ballad of the Burning Star. Photography: Alex Brenner. Multi-award winning Theatre Ad Infinitum (Translunar Paradise, The Big Smoke, Odyssey) presents an explosive tale. Armed with music, killer heels and a lethal troop of divas an enraged Israeli executes a story of victimhood, persecution, aggression and love. 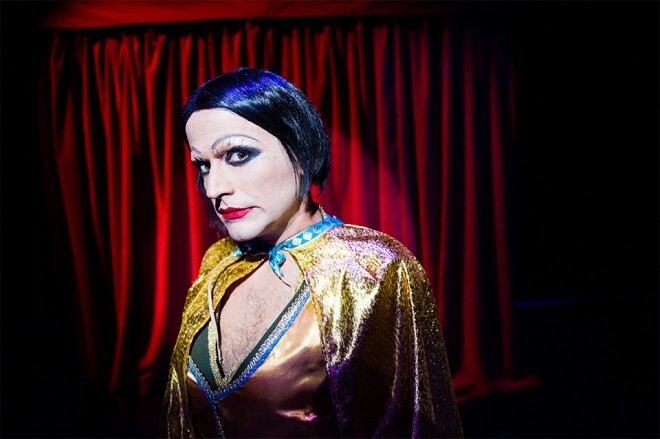 With shrapnel sharp voices and moves as smooth as an oiled tank chain, this cabaret troop invites you on a journey into the core of the Israeli-Palestinian conflict. Presented by Acting Up Stage Company and Why Not Theatre, in association with Koffler Centre of the Arts. … A piece of musical theatre quite unlike any other: all singing, all dancing, all preconception-shattering. It’s unsettling, disturbing and so important as good theatre must be. Whatever it is, this dance-meets-musical-meets-dragshow-meets-comedy-routine-meets-political-art-meets-play, is a must see!